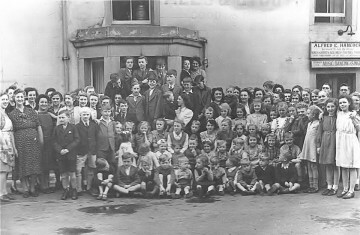 This picture is taken outside the former Grouse Inn during the 1945 VE Day Celebration (victory in Europe WWII). The sign above the pub shows that the licence at this time was Alfred Edwin Hancock . The sign to its side advertises music, dancing and singing, upholding the opinion of village elders who remember the pub all commented on the pubs reputation for singing.